Los Angeles Times - Mar. 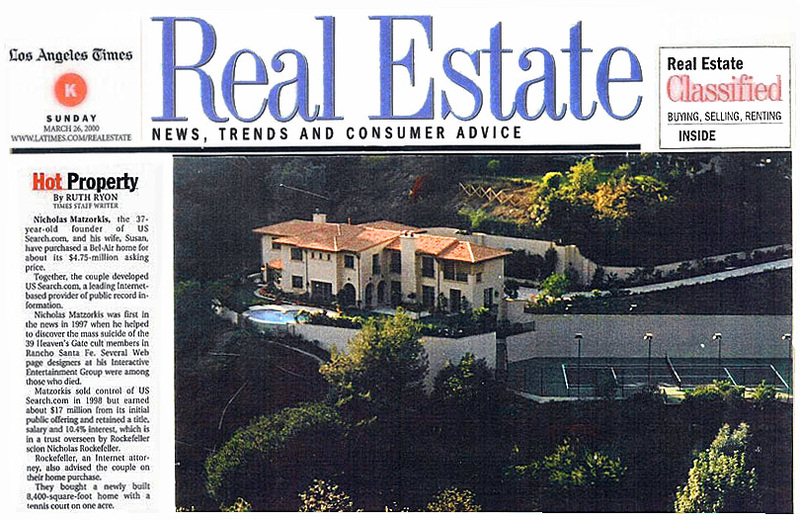 26, 2000: Nick Matzorkis, the 37-year-old founder of US Search.com and his wife, Susan, have purchased a Bel-Air home for about its $4.75-million asking price. Together, the couple developed US Search.com, a leading Internet-based provided of public record information. Matzorkis sold control of US Search.com in 1998 but earned about $17 million from its initial public offering and retained title, salary and 10.4% interest, which is in a trust overseen by Rockefeller scion Nicholas Rockefeller. Rockefeller, an Internet attorney, also advised the couple on their home purchase. They bought a newly built 8,400-square-foot home with a tennis court on one acre.